Air Mauritius is well on the road to recovery, a year into a five-year plan that aims to implement a new business model that restructures its operations to become less dependent on traditional, but flagging, European markets and instead turn the airline’s focus to the growth markets around the Indian Ocean Rim and Asia. A seven step recovery plan launched in Feb-2012 as profits crumbled into losses saw Air Mauritius undertake a major network consolidation which involved withdrawing its services to Germany, Italy and Switzerland as well as service reductions to China, Australia and Africa. But, with its network brought back into balance, and profitability restored, Air Mauritius has resumed a growth path with plans to launch a direct service to Beijing and reinstating some suspended routes and capacity in key markets. Air Mauritius was forced into taking action when the airline posted a group loss of EUR29.2 million (USD38.2 million) for the fiscal year ending 31-Mar-2012 as demand from recession-hit Europe fell along with high fuel costs, volatile exchange rates and yields pressure from increased competition. In addition a review of Air Mauritius’ business model identified that the airline’s fleet of 12 aircraft across four types was inefficient, its network was suboptimal with too many single frequency destinations and the long-haul fleet needed to be replaced with a more efficient Airbus fleet. To date the airline has not placed any orders for new aircraft. The first two phases of Air Mauritius’ recovery plan called for network optimisation and improved cost and revenue management. Network consolidation has been completed with the carrier cutting seven routes and reinforcing 17 others, including Paris Charles De Gaulle (CDG), London Heathrow, Kuala Lumpur, Singapore, Perth and Johannesburg either through increased capacity or relationships with partner airlines. Long-haul routes serviced just once per week were scrapped in favour of services where the carrier can offer more services or open new routes. Air Mauritius followed restructures by fellow Vanilla Islands carriers, Air Austral in La Reunion, Air Madagascar and Air Seychelles. To the east, Air Mauritius is building capacity to China, including Hong Kong, while also operating to Singapore via Kuala Lumpur, as part of Air Mauritius’ strategy to rebalance the carrier’s growth towards new markets. Air Mauritius will commence a once weekly direct service from Mauritius to Beijing on 06-Jul-2013 providing further access to China's booming demand for luxury tropical getaways. Beijing will be its second direct flight to China following the introduction of twice weekly service to Shanghai on 24-Jan-2013. A single weekly service to Shanghai was briefly dropped in Oct-2012. Both routes will be served with three-class A340-300 aircraft offering 296 seats. “Since we started operations to Shanghai in 2011, tourist arrivals have grown consistently to pass the 20,000 market in 2012,” Air Mauritius CEO Andre Viljoen stated. The Beijing service will increase Air Mauritius’ capacity to China by 50% to about 900 one-way seats per week. Air Mauritius wants to build its Mauritius hub as a link between Africa and Asia. The carrier also operates twice weekly Mauritius-Hong Kong service, offering 550 one-way seats per week using A330-200 aircraft. It will restore a third frequency to Hong Kong on 02-Jul-2013, last operated in Feb-2012, increasing capacity on the route to about 850 seats per week and taking total frequencies to Asia to nine per week. Air Mauritius operates three weekly services from Mauritius to Kuala Lumpur with one of those frequencies going on to Singapore each week. In addition a codeshare with Malaysian Airlines allows passengers to connect to Shanghai, Hong Kong and Beijing. The airline also operates to three points in India, including Mumbai four times weekly, Delhi twice weekly and Bengaluru once per week. Air Mauritius has a codeshare with Air India. 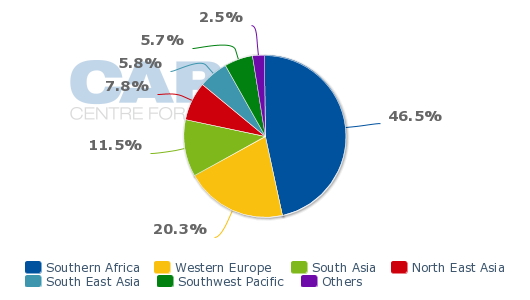 While southern Africa is Air Mauritius' biggest market, the combined Asian region account for more than 7,300 seats per week or 25% of total capacity, surpassing Western Europe’s 5,900 seats. In Feb-2013 Western Europe accounted for 35% of capacity. The governments of Mauritius and the Republic of Maldives signed a bilateral air services agreement in Feb-2013 to encourage direct services between the two countries and tap into the emerging Chinese tourism market, especially Beijing. The agreement allows for multiple designations of airlines from both countries. Air Mauritius and Mega Maldives Airlines have been designated to operate direct flights between Beijing and Mauritius. 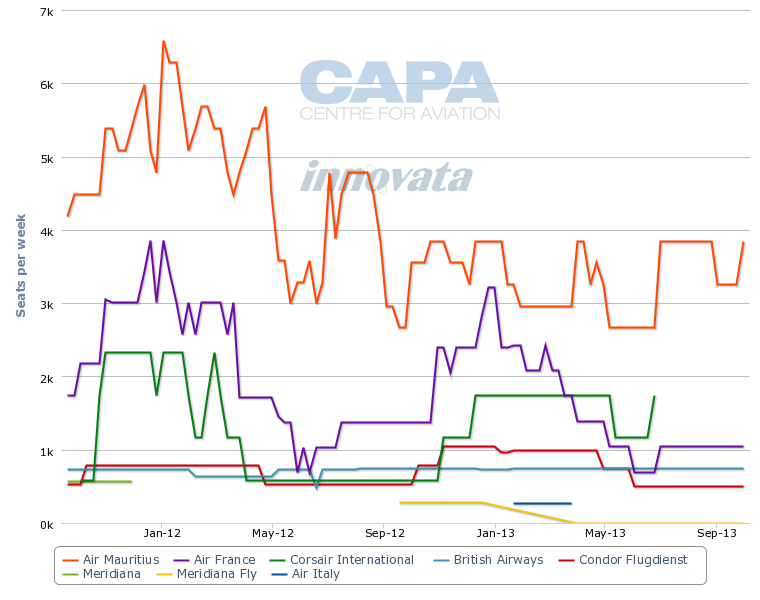 Seven flights per week are expected to be operational by Jul-2013 under the agreement. Mega Maldives plans to commence a weekly direct Mauritius-Beijing service on 09-Jul-2013 with a three class Boeing 767, but will build this to a daily service offering about 1,800 seats in Aug-2013. This will take the total direct services to Beijing to eight per week, including Air Mauritius’ single weekly frequency, and total frequencies from Mauritius to greater China (including Hong Kong) to 13 per week and 3,200 seats. Mega Maldives currently serves several cities in greater China with a fleet of one 757 and one 767. About 230,000 Chinese tourists visited the Maldives in 2012. The new Maldives-Mauritius agreement would allow the market to be shared between the two countries while also encouraging trade between Mauritius and Maldives. Air Mauritius’ moves to concentrate its network and focus on growth to emerging markets has compensated for the decline in European traffic. Services to Milan, Geneva and Frankfurt were suspended during the course of 2012. Air Mauritius continues to service its traditional European market, but with reduced capacity. Mauritius-Paris Charles de Gaulle remains the carrier’s biggest long-haul route, but now relies heavily on partner Air France for onward access to other points Europe using codeshares to six destinations in Italy, 10 in Germany and three in Switzerland. Air Mauritius will also resume twice weekly flights to Durban from 05-Jul-2013 using A319 aircraft. To make room for the Durban services, frequencies to Johannesburg will be reduced from 10 per week to daily. Some supplementary flights to both Johannesburg and Durban may be operated during peak periods to cater for any additional demand. Air Mauritius competes in the Mauritius-Johannesburg market with South African Airlines (SAA) and British Airways' South African franchise Comair. SAA currently operates about 1,250 one-way seats per week against Air Mauritius’ nearly 1,900 seats and only about 120 seats from Comair/BA. Air Mauritius has the Mauritius-Durban route to itself. Air Mauritius also has the Mauritius-Cape Town route to itself, which it currently serves with three weekly A319 frequencies. 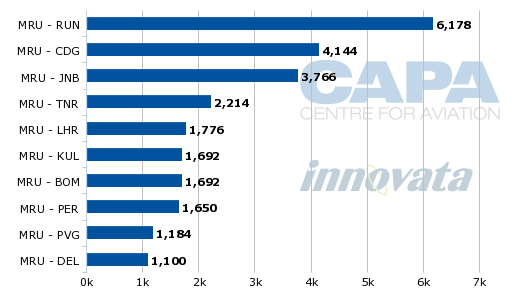 During 4Q2012 frequencies were added to Cape Town, Nairobi and Antananarivo. The airline competes with Air Madagascar on the Mauritius- Antananarivo route with about 1,100 seats against 260 seats offered by Air Madagascar. It is the only carrier on the Nairobi route, which it currently serves with three weekly flights. Mr Viljoen has stated that developing operations to Africa is part of the strategic plan and Durban is a fast growing commercial centre which presents opportunities for Mauritius. The carrier has developed its African hubs in Johannesburg and Nairobi by strengthening its codeshare partnerships with SAA and Kenya Airways. “This puts Mauritius in a better position to fulfil its potential as a conduit for trade, travel, commerce and financial services between Africa and Asia.” Mr Viljoen said. Air Mauritius restored Mauritius-Perth route to three-times weekly with an A330 and considers Australia as offering “great potential” for growth. The airline suspended services in Sydney and Melbourne in May-2012. The airline has formed a codeshare partnership with financially challenged Air Austral. Air Austral withdrew its Reunion-Sydney-Noumea route in Aug-2012. The codeshare allows Air Austral and La Reunion to maintain a presence in the Australian market while also supporting Air Mauritius' Perth operation. Air Mauritius and codeshare partner Emirates have agreed to explore opportunities to further develop commercial opportunities as part of Air Mauritius’ broader plan to form closer links with other airlines to “reinvigorate commercial and revenue management”. Air Mauritius already codeshares on Emirates’ 14 frequencies between Mauritius and Dubai. 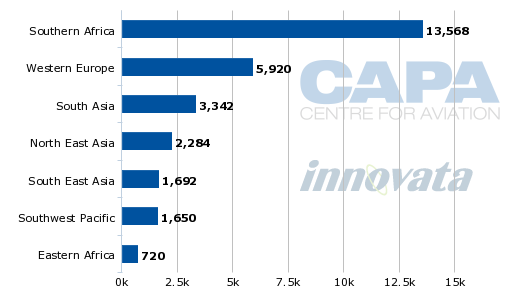 Emirates operates the route with 777-300 aircraft and has built capacity from about 3,100 one-way seats in Oct-2011 to around 5,000 seats in Apr-2013, according to CAPA and Innovata data. However, Mauritius does not have the same geographic advantage as Air Seychelles further to the north, as a staging post between Asia and Africa. Etihad has forged a close relationship with Air Seychelles, including taking a 40% equity stake and lending management oversight. A codeshare with Etihad has allowed Air Seychelles to serve Hong Kong via Abu Dhabi, effectively giving Etihad an Abu Dhabi-Hong Kong flight in absence of its own service to Hong Kong due to aircraft shortages. See related article: Air Seychelles looks to ride Chinese boom & grow in tandem with part-owner Etihad – Australia next? 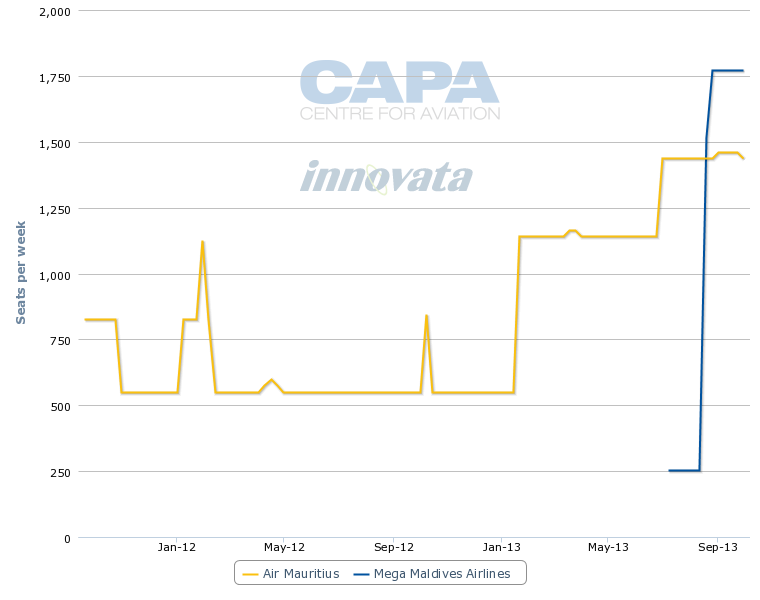 Results of Air Mauritius’ recovery plan are already beginning to flow with the carrier returning to quarterly profits over the second half of 2013. For the quarter ending 31-Dec-2012 (3QFY2013), Air Mauritius reported a group profit after tax of EUR6.4 million (USD8.4 million), turning around a loss of EUR3.2 million (USD4.3 million) for the comparable period in FY2012. The 3QFY2013 profit helped to reduce losses for the first nine months of FY2013 to EUR2.6 million (USD3.4 million) compared to the EUR22.6 million (USD29.5 million) for the same period in FY2012. Service suspensions to Europe resulted in overall passenger numbers reducing 0.9% to 969,488. 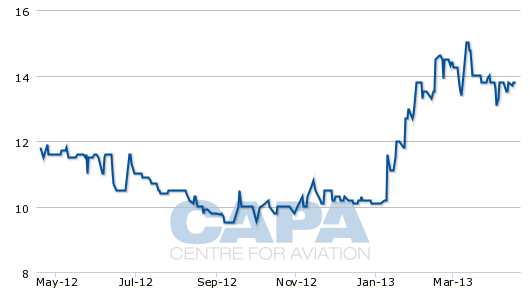 Air Mauritius’ shares, listed on the Mauritius Stock Exchange, have gained 37% since the start of 2013, closing at 13.8 Mauritian rupees (USD0.45) on 17-Apr-2013 as the carrier begins to deliver on its plan. Air Mauritius appears to have successfully rebalanced its network away from an over dependence on Europe in favour of generating traffic flows between Asia and Africa, and its recovery plan is yielding the early results putting the airline on track to return to full year profit in FY2014. As an end of line carrier, however, it will need to develop deeper relationships with larger network airlines to provide sustainable traffic to the island nation whose economy is dependent on tourism. In particular it will eventually need to find a Chinese partner to provide greater feed traffic and win a larger share of that lucrative market.